Nylon cartridge filter is precisely manufactured for use in critical filtration applications within food, pharmaceuticals, biotech, dairy, beverages, brewing, semiconductor, water treatment & other demanding process industries. It’s upstream & down stream polyester support ensure resistance to pressure shocks. 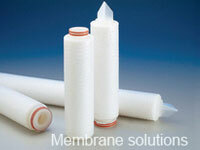 Nylon membrane is hydrophilic in nature .The membrane possesses broad chemical compatibilities & contains no surfactants. Nylon Cartridge filters are produced in controlled environments & under stringent production conditions that ensure filter quality & cleaniness. Their assembly is performed integrally by thermowelding. This process minimizes the presence of oxidization of substance & yield a durable filter cartridges suitable for extended use. This can be sanitizes by chemical agents or by inline steaming. Nylon and polypropylene the unique two materials used in cartridge manufacturing are chemically inert not shedding and biologically safe according to F.D.A., USP and EEC requirements for pharmaceutical and food contact use. The filtration area of each cartridge is as high as 0.70 m2. Therefore it offers High flow rate, Low pressure drop & Long service life.